23 years ago today World Championship Wrestling would present Clash of the Champions XXV — an event steeped in a crisis few fans even knew about. This week Throwback Thursday on WrestlingDVDNetwork.com takes a look back at one of WCW’s most controversial events ever, thanks – as always – to the WWE Network. After a successful Halloween Havoc PPV the boys flew across the pond for a scheduled European tour. On October 27th, in Blackburn, England, a bar room argument between Arn Anderson and Sid Vicious turned physical, and eventually led to a scissor fight that nearly ended the life of Arn Anderson. Though both men were suspended, many in the WCW locker room wanted Sid Vicious fired and threatened to boycott COTC XXV and the upcoming BattleBowl PPV if nothing was done. Though this show went off without a hitch, BattleBowl was in serious doubt after WCW officials continued to drag their feet in dealing with Sid in a manner satisfactory to the locker room. As a result of the scissor fight in Blackburn, Sid would be removed from the main event of Starrcade ’93, where he was penciled in to win the World title from Vader, and replaced by Ric Flair; Arn Anderson, who was penciled in to face Paul Roma, would be unable to work for months, on top of his suspension; and a new round of “Orlando tapings” were hastily arranged to re-shoot now useless footage. To top it off many in TBS were again openly questioning Ted Turner’s decision to keep the still-fledgling wrestling company on the books much less on the air. Context is a major issue here as only the previous COTC and PPVs are available on the Network. After the opening montage “Mean” Gene Okerlund, who debuted for WCW on the November 6, 1993 edition of Saturday Night (a series currently unavailable on the Network), welcomes us to the show. 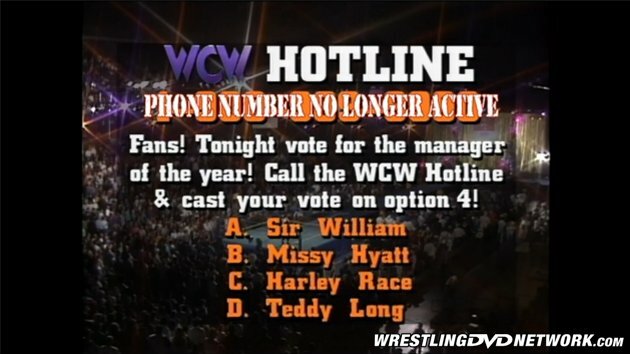 We get a plug for the WCW Hotline where fans can vote (on option 4) for the “Manager of the Year” award. Okerlund tosses it to Tony Schiavone and Jesse Ventura who talk about the card, highlighting the main event, before Rick Rude makes his way to the ring for the opening match. The story here goes back to the last COTC when Road Warrior Hawk and Road Warrior Animal made their surprise returns to WCW to join Dustin Rhodes in a match against Rick Rude and The Equalizer. This one starts out as a strongman stalemate until Rude sneak attacks Hawk during a test of strength before the match settles into a back and forth battle. Eventually Hawk clotheslines Rude over the top rope and the two battle to a double count out at 5:39, much to the displeasure of the crowd. 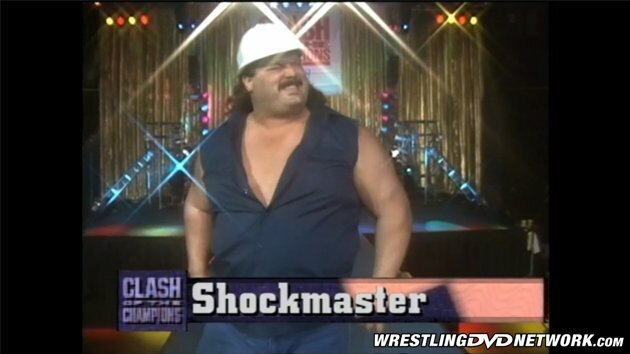 After falling flat on his face at the last COTC The Shockmaster was quickly repackaged into a buffoon who wore a hardhat to protect his head in the event of a fall. Here, with goofy music and clownish demeanor, Shockmaster does his best to make the best out of a Shockmaster situation. Not much happens in this one. Shockmaster takes most of the damage until turning the tables late. In the end, Shockmaster hits a bearhug slam for the pin at 2:29. 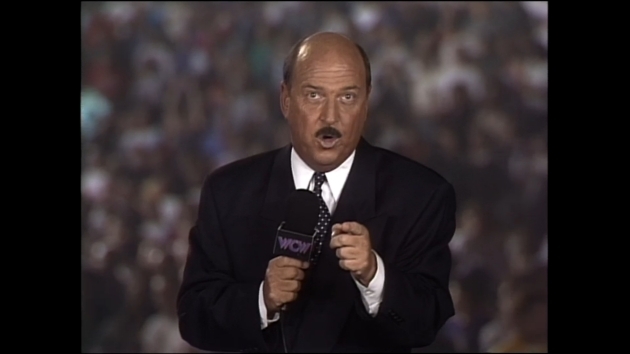 After the match we get another Okerlund plug for the WCW Hotline before Okerlund interviews Col. Parker. Parker says that Sid is out of the Stable and that “Stunning” Steve has taken Viscous’ place. Parker claims to have a restraining order against Sid while Okerlund claims to have seen someone looking like Sid in the restroom. These two met the week prior on WCW Worldwide (a series currently unavailable on the Network) where Regal used a handful of tights to get the win, setting up this return match. In the middle of the match we hear that Davey Boy Smith has challenged Rick Rude for a title match after a backstage altercation. Back to the match, Badd connects with the big left hand and goes for the pin only for Sir William to drape Regal’s leg over the bottom rope for the break. When Badd tries to get Sir William, Regal school boy’s Badd from behind and scores the 1-2-3 with another handful of tights at 6:34 to retain the TV title. Pillman immediately tears into “Stunning” Steve as the former Hollywood Blondes go to war. This match is nothing short of a fight in and out of the ring early on before settling into a nip and tuck battle. Austin misses a Stun Gun and Pillman goes for a slingshot move from the outside in when Col. Parker grabs Pillman’s foot who crashes head first into the mat. Austin rolls Pillman up, grabs a wad of tights, and scores the pin at 9:11. Great, great match. After the bout Pillman goes after both Austin and Parker but the two escape. Next we get a BattleBowl control center where “Mean” Gene goes over the rules of the event before we get a couple of promos from Paul Orndorff and Sting. This marked a sort of homecoming for Dusty Rhodes to the Bayfront Arena, where Dusty had many of his greatest matches. The beef between the Assassin and Dusty Rhodes, in 1993, goes back to Slamboree ’93 when the Assassin challenged Rhodes (38:23) to a fight which Rhodes accepted (2:07:17), but nothing much came of it at the time. So, while Dustin and Orndorff are wrestling in the ring, Assassin #1 and Dusty stalk each other on the outside. As for the match, it’s an old-time professional wrestling match full of psychology. Dustin misses the running bulldog late and Orndorff tries to take advantage. After Orndorff misses a knee from the top rope Dustin rolls him up in an inside cradle for the pin at 12:16 to retain the U.S. title. After the match Orndorff and the Assassin attack Dustin. Dusty starts to unmask the Assassin when Orndorff cracks Dusty in the ear with a roll of tape. Orndorff holds Dusty as Assassin hits “Dream” with the U.S. title. Orndorff goes for the piledriver on Dusty when Dustin makes the save. Next up “Mean” Gene says he’s been “huddling in the back” to get any information on Rick Rude and Davey Boy Smith. Then we get another plug for the “Manager of the Year” poll on the WCW Hotline with the results to be revealed at Starrcade ’93. This was the first match for the team of Sting and Davey Boy since the August 28, 1993 edition of Saturday Night. The match is a brawl before the bell with Sting and Knobbs in the ring and Bulldog and Sags on the ramp. In the midst of the fight Rick Rude comes out and hits the Rude Awakening on Bulldog before Road Warrior Hawk makes the save. Sting helps Bulldog to the ring as the bell sounds and the match gets under way. Though Sting fights, the opposition is too much. Eventually Sting makes the tag and Bulldog tears into the Nasty’s. After some double team work Bulldog hits the big powerslam, but the referee’s back is turned. Sags hits a stiff elbow on the back of Bulldog’s head from the top allowing Knobbs to roll over and score the pin at 8:31 to retain the titles. After a plug for Jesse Ventura’s appearance on the WCW Hotline, we see Col. Parker confront Ric Flair as Flair prepares to head to the ring. Col. Parker tells Flair that “Stunning” Steve, after defeating Pillman, challenges the winner. Parker continues to run his mouth until Flair decks him! 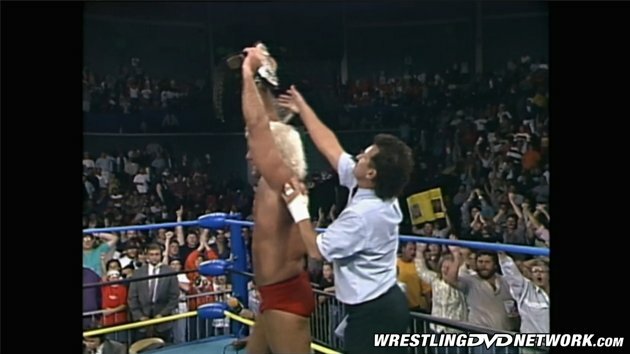 Flair earned this title shot after defeating Sid Vicious on the October 30th edition of Saturday Night, the same match where Sid turned on Col. Parker to kick the Vader/Sid Starrcade angle into motion. Unfortunately, the events in the UK put a halt to all of that and this suddenly went from a throwaway COTC main event to a dry run for Starrcade ’93. This isn’t a bad match, but it follows the same pattern their Starrcade match (a true classic) would. Flair’s offense comes in spurts with lots of top rope moves. Late in the match Vader clotheslines the referee by mistake. Vader hits a huge superplex and goes to the top for the moonsault but Flair moves, covering Vader. 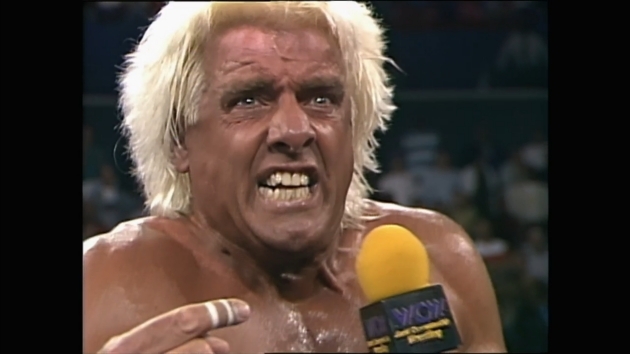 The referee crawls over, slapping his hands on the mat three times and everyone thinks Flair’s the new World Champion. The referee says no, that Vader was DQ’d for the clothesline and that the Flair is the winner by disqualification. After the match Col. Parker and Austin hit the ring and, with Vader, put the boots to Flair until Dustin Rhodes and Shockmaster make the save. “Mean” Gene gets in to interview Flair, who challenges Vader and Austin to a match between himself and Sid Vicious, which Parker accepts. Jesse and Schiavone talk about Flair being robbed, slip in a last plug for the WCW Hotline, and sign off. Even with all the backstage craziness and confusion, this ranks as one of the better COTC‘s. With only one bad match, Equalizer/Shockmaster, Clash of the Champions XXV delivered a solid card from start to finish, a real classic in Pillman/Austin, and righted a ship many fans had no idea was in total disarray. And with that, we come to the end of this week’s TBT. If you already subscribe to the WWE Network, go check it out and let us know what you think. Need more Network coverage and scoops? Visit our friends at WWENetworkNews.com. Watch WCW Clash of Champions, the Survivor Series 2016 PPV, and 6,000 more hours of content on WWE Network. Your first month is 100% FREE! Click here to subscribe to WWE Network.